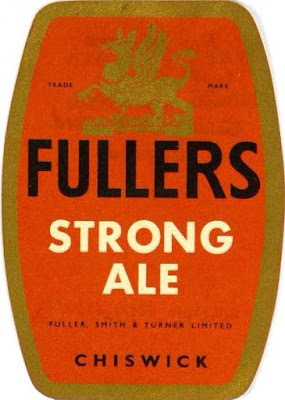 Another Fullers beer from the late 1950’s, this time a strong bottled beer. Though you may find the recipe rather familiar. Everyone knows how Fullers proudly uphold the tradition of parti-gyling to this day, brewing Chiswick, London Pride, ESB and Golden Pride from one basic recipe. Back in the day, they did something similar with their dark beers. From that recipe they brewed X (or Hock) their Mild, OBE, their draught Burton and SA, a bottled Strong Ale. In reality a Mild Ale, a strong Mild Ale and a very strong Mild Ale. I used to think that strong Mild had died on the Somme, but, as ever, reality is far more complicated. Southern Old Ales – like the one Harveys still brew – were really strong Milds. And many stronger dark bottled Ales, like Fullers SA, were stronger versions still. It made a lot of sense to brew this way. The market for stronger beers was relatively small. If your brew length was several hundred barrels, as at Fullers, it made sense to parti-gyle a small-batch beer with something else. This particular brew produced 53 barrels of SA, 9.74 of OBE and 277 of Mild. I can’t really say much about the recipe, as it’s essentially identical to the last. And that you’ll need a good dose of caramel to get the right colour. Could you explain the differences you're thinking of when you split this off as a Mild rather than a Strong? Is it a more clear cut division than trying to sort out from the muddle that makes up the Porters and the Stouts? I didn't say I'd classify it as a Mild Ale. I'd call it a Strong Ale. I was just pointing out that it was really just a much stronger version of their standard Mild. OK, I see the point. So in theory a brewer might have done something similar with their standard recipe Brown and brew a stronger version and call it a Strong? most brewers didn't have a standard Brown Ale recipe. It was mostly just a version of their Dark Mild by this period. There were stronger Brown Ales, but they usually had totally different recipes from the weaker ones. At least in the brewing records I've seen. Every day it gets clearer to me how little sense there is in rigid style definitions of beer geeks. I drank school milk in the 1960's and 1970's. Nothing like Mild. It all makes sense to me, sort of. But I have a pretty flexible view of beer styles.